File contains a VHS videocassette from September 2001. File contains an autographed photograph of Frederick Herbert Torrington, a choral conductor in Toronto, Ontario. File contains a letter from Frank Squire Welsman. The letter concerns the Toronto Symphony Orchestra, and requests John Daniel Logan's help in promoting and supporting their endeavours. 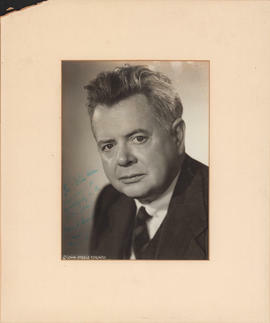 File contains an autographed photograph of Sir Ernest MacMillan, the conductor of the Toronto Symphony Orchestra, in commemoration of a performance with Ellen Ballon of Heitor Villa-Lobos' first piano concerto. File contains drafts of Anthony Pugh's program notes for Atlantic Symphony Orchestra (ASO) concerts an copies of the ASO's programs containing Pugh's notes.